I found Lamhe (directed by Yash Chopra) for free with subtitles on YouTube… I watched it mainly for the two leading actresses, Sridevi and Waheeda Rehman, and also because I had been made kind of curious by a scene/song in the movie that I’d seen before, “Parody,” which referred to a number of much older Hindi movies (more on that later on). And I know it got some awards and good reviews and was well liked abroad, even if it had flopped in India. It was well put together and well paced and Sridevi gave a good performance (given the character roles she was playing), and Waheeda Rehman was good too (nice to see someone from the old films I’ve been watching still alive and active 30 years later, and almost as lively and attractive as she was then). So, it kept me watching until the end. But by the end, I knew this was a movie I could definitely live without. Lamhe (Moments) is just wrong. Sorry. It seems the film divides people into two camps: those who don’t mind the mother-man-daughter love triangle, and those who do. Unfortunately, while the PPCC considers itself pretty tolerant, we fall into the latter camp. We just found it… nasty. But now I’d like to move onto another aspect to this film that put me off, especially when viewed in contrast to the Golden Age classics that I’ve come to love. And that is, I got really weary of seeing the main characters’ fancy houses and affluent lifestyles, especially considering that there was no other kind of lifestyle shown in contrast, even for a brief time. In this scene, Pooja and Viren’s friend Prem perform a bunch of Golden Age songs to cheer up our hero, because Viren supposedly loves old Hindi movies. (Though I don’t think there was any mention of that fondness until right before this scene began – in the middle of the movie (unless, once again, I dozed off or something) – and we never hear about it again.) The scene is amusing, and it gets better when Waheeda Rehman joins in the spoof and performs a song that she actually had done back in the old days. But the whole scene – taking place by the suburban house, the garage the fountain, etc. – also reminded me of certain qualities of the older films that this 1991 film definitely doesn’t have. And one is the social consciousness. In those older movies, there was some soap opera too, and people did get lost in their love affairs, but there was also an awareness about the surrounding world, with all its problems, that extended beyond the characters’ romantic brooding – or else overlapped with that romantic brooding in an interesting way. 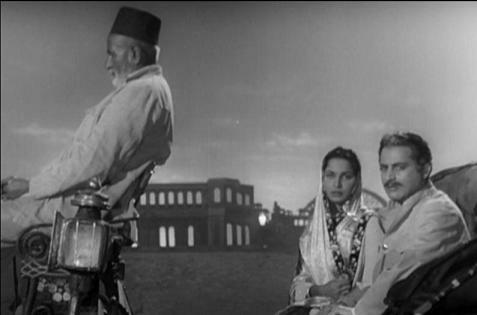 Several of the films referred to in this scene – such as Baazi or Shree 420 or Pyaasa – contain a lot of strong social content and a political-philosophical message or theme. In Lamhe, as far as I can tell, it’s nowhere to be found. These rich people just seem to get lost in their obsessions over their emotional relationships without having to think at all about the political and economic conditions of the world. And for me, personally, their affluence becomes more dreary to look at when it’s transported to the UK. At least it’s interesting to look at old Indian mansions and palaces, and there is nice scenery in everybody’s home state, Rajasthan. But do I want to watch affluent people cavorting around in suburban houses and shopping malls? There are reasons why I got so drawn to classic Indian films after more than 40 years of exposure to western media. If I want to see this kind of setting, I can turn on my TV any time or go to the suburban multiplex. Oh, well, I think I’ll go look for another ’50s movie now. I believe Rafi is singing on Bharat Bhushan. And Lata Mangeshkar’s voice comes in near the end, with a nice chorus. 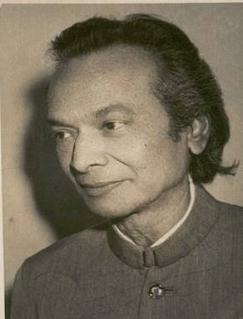 Fantastic music by Naushad. From Baiju Bawra (1952), directed by Vijay Bhatt. P.S. I guess that everyone knows that this is the week to celebrate Mohammed Rafi’s birthday… Born December 24, 1924. 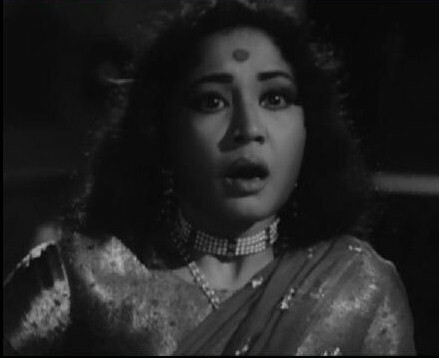 Ah, there is nothing like a relentless and brutal social tragedy to provide much-needed catharsis in difficult times – especially when it contains magnificent performances… Now I really know why Meena Kumari was the tragedy queen. 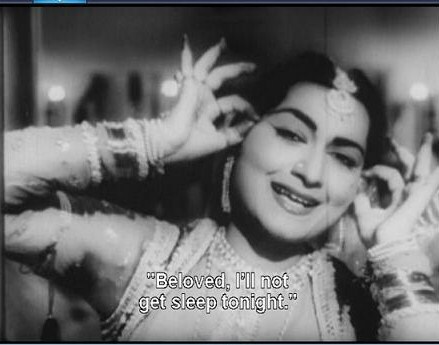 And if I didn’t sufficiently appreciate Waheeda Rehman before, I do from this film. Guru Dutt also does a fine job as a sort of helpless observer, more in command of his own fate than some of the other characters, but basically unable to do anything about the evils around him. Dutt’s character, Bhootnath, goes through a transition that reminded me a little of a few characters (or versions of the same character) played by Raj Kapoor. When he first enters the scene of the film – this great, aristocratic mansion of the 19th century – he is considered a sort of simpleton, awkward and naive. But he ends up surprising people around him with his cleverness, intelligence, and sensitivity. The difference here is that unlike that Raj Kapoor character, Bhootnath doesn’t become a moral leader and doesn’t effect any changes in the social environment. Though he does accomplish some interesting things personally, in addition to improving his own station in life… For one thing, he eventually finds himself in a successful romance with the smart and independent Jabba, played by Waheeda Rehman (though that path has been strangely predetermined as we learn later). 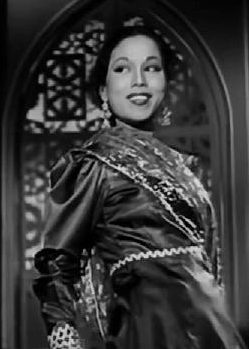 More impressively, he manages to become a good friend and confidante of a woman of much higher status (though more modest origins); that is, Meena Kumari’s tragic character, Chhoti Bahu. But he can only listen to her problems rather than help solve them, and his existence eventually only contributes to her seemingly inevitable demise. Another interesting irony in Chhoti Bahu’s tragedy is that it leaves us both hating her husband, Chhote Babu, and hoping against his destruction. This is a selfish, sadistic and morally worthless man. But because of his wife’s endless devotion to him (not to mention the unbreakable ties prescribed by society), we know that if and when ills befall him, this will only mean more suffering for her. So, when this despicable character is badly injured in a fight, though the viewer (or at least this one) can’t help cheering for a moment, we’re soon filled with dread. The way that the film winds up is not surprising, but the execution (a terrible pun, when you think about it) makes it horrifying nonetheless. This film is highly effective due not only to the great performances but also the brilliant direction, shared by Abrar Alvi and Guru Dutt. (The former got all the credit officially while the latter gets all the credit in people’s minds. But let’s just say they collaborated and leave it at that.) A lot of credit has also been given to the cinematographer, V.K. Murthy, which makes sense, because Sahib Bibi Aur Ghulam is so beautiful to look at right from the start. Usually, however, this is a bleak kind of beauty. We’re told of the splendor of the mansion, but it always looks far more oppressive than splendid, and the most impressive shots of the whole place are pictures of its ruins, as observed by Bhootnath during a work-based visit years following its decline. The ending of the movie looks so downright gothic, I couldn’t help thinking of Mahal. 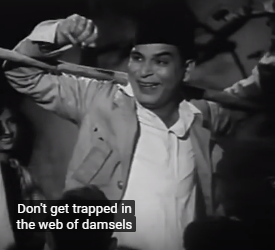 But Sahib Bibi Aur Ghulam contains none of Mahal‘s dark humor (even though one might find some very dark humor in Kumari’s performance at times), nor does it have any of Mahal’s horror-movie-based, borderline campiness. This film is just expertly tragic, and devastating. Sleep Deprivation Is A Terrible Thing! P.S. I was inspired to finally go out and get this one after I listened to the soundtrack found here. Dilip Kumar being very energetic in a film that he also wrote and produced… This is one of my favorite scenes with him. Of course, Mohammed Rafi’s singing contributes something too (as do all these great dancers, Naushad’s terrific music, and the love interest). P.S. You can sort of consider this my Dilip Kumar birthday post, though it’s a bit late. Some people got to it on time.